This dish is brought to you by our friends over at Teeny Tiny Kitchen, Launie and Jedd. It’s a meal that is packed full of fun flavors and will warm your soul. Check out the cute story on their blog on how they came up with this recipe. Mix all of the ingredients in a blender until smooth. Heat olive and butter in a saute pan on medium heat until the oil shimmers and the butter bubbles. 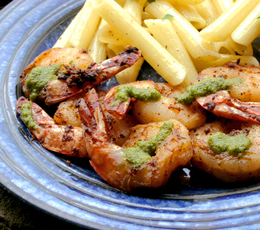 While the pan heats, pat any excess moisture from shrimp and season with cumin, paprika and a dash of salt. Add shrimp to the pan and cook, flipping once, until nearly done (about 2 minutes per side). With shrimp still in the pan, deglaze by adding 1-2 tablespoons dry white wine and lemon juice to taste, scraping the pan bottom and stirring the shrimp for another minute or two. Serve with Launie’s parsley sauce. This sauce is so good that the cumin, paprika, etc. are almost overkill. If you’re not a fan of cumin: 1) I give you the hairy eyeball, but respect the limits of your palette; and 2) you can ignore all of the above ingredients, except the shrimp and the olive oil, and just enjoy the purity of shrimp with an incredible sauce.